Helicobacter pylori (H. pylori) is a very common bacteria. It is estimated that 50% of the world population are infected with this bacteria and most people don’t know it. They grow in the stomach and digestive tract. 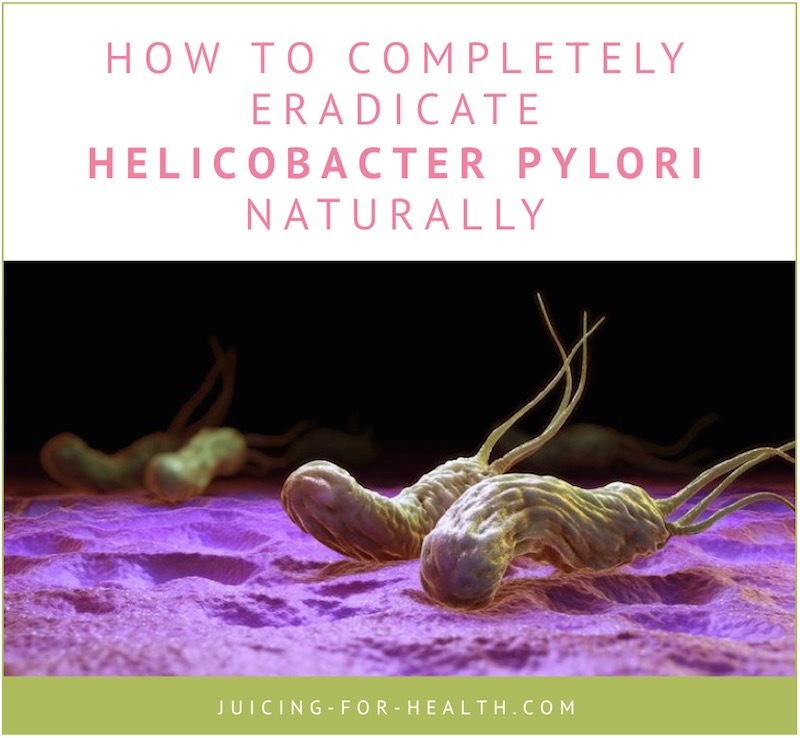 This article explains why it is so important to use Helicobacter pylori natural treatments to completely eradicate this bacteria, instead of using prescription antibiotics. According to data from CDC, these bacteria are responsible for up to 80 percent of gastric ulcers and 90 percent of duodenal ulcers. They are also said to be the cause of many other digestive disorders, including acid reflux. “Helico” means “spiral”. The bacteria is spiral-shaped and they drill into your stomach lining, and hide in the mucus where your immune cells cannot reach them. They can live in the harsh acidic environment of the stomach by producing an enzyme called urease to neutralize stomach acids in order to protect themselves, thus creating an issue of low stomach acid. In order to live, they use up enzymes and nutrients in your body, and at the same time dumping their wastes and toxins into your system. They cause damage to your cells and mitochondria that result in chronic fatigue and inflammation. The International Agency for Research on Cancer has classified H. pylori as a carcinogen (cancer-causing agent) in humans. It has been increasingly accepted that infestation of H. pylori in the stomach causes gastric cancer and gastric mucosa-associated lymphoid tissue (MALT) lymphoma. H. pylori can spread through contaminated food and water and through mouth-to-mouth contact. How Do You Get Diagnosed For H. Pylori Infection? If you have any of the above symptoms that persist, do get tested for possible H. pylori infection. Breath Test: This test requires a 6-hour fast. It is an effective test with over 90% accuracy, because this organism emits urease that can be detected in the breath. The infected individual will be asked to swallow a capsule containing urea (nitrogen and carbon) that your body produce naturally. In the presence of H. pylori, the urea will break up into nitrogen and carbon as carbon dioxide. Endoscopy: An endoscopy is performed to collect specimens from the stomach and duodenum. Diagnosis is then made by examining them under the microscope in a lab. Stool Test: A stool specimen is collected from the infected individual to detect the infection. This test is called the Helicobacter pylori Stool Antigen (HpSA) and is highly accurate for diagnosing the bacteria. If you have been diagnosed to be infected by the H. pylori bacteria, it is very likely that your doctor may prescribe you several antibiotics in the hope of killing the bacteria. More often than not, antibiotics are prescribed for two weeks. If you also have acid reflux caused by the bacteria, proton pump inhibitors (PPIs) may also be prescribed. In some infected individuals, the medications are not able to totally wipe out the bacteria, thus they will be instructed to take another two weeks of possibly stronger medications. Studies show that as many as 20% patients will have recurring infections despite the antibiotics and PPIs, thus this conventional treatment must not be your first choice of treatment. Read here about the dangers of using antibiotics and PPIs, and why they must be avoided at all costs. Nature has provided everything you need to completely eradicate H. pylori naturally. Follow this two-step natural treatment that works without any adverse effects, and support with natural antibiotic foods. I’ve been asked many times, whether an infection of H. pylori can be cured? Yes!! From my experience with my clients using the following protocol, we were able to get rid of H. pylori bacteria any time within one and two months. Here’s what you can do yourself at home to get rid of H. pylori bacteria without using prescription antibiotics. Always start with a gastrointestinal cleanse to clean out the tract. We understand that H. pylori drill into your stomach and intestinal lining; they hide and are “protected” by mucus so that your immune cells cannot get at them. A gastrointestinal cleanse by way of drinking high fiber works like a broom to clean out the intestinal tract and expose these bacteria. Go here for a comprehensive guide to effective gastrointestinal cleansing. Once the bacteria are exposed, the natural parasiticides that you ingest will be able to make contact with the bacteria to completely strip them off your intestinal wall lining. A parasite cleanse will completely kill all parasites, bacteria, yeasts and fungus. In the presence of H. pylori, there is a high likelihood that there are other harmful microbes and a possibility of SIBO (small intestinal bacterial overgrowth). The parasiticides are herbs that are recommended to be taken in very low and safe dosage to gradually kill the harmful microbes. Taking more does not mean better! Killing too much of the bacteria may cause a Herxheimer (die-off) reaction where the huge amount of microbes that die will produce more toxins than your liver can handle. Therefore, it is important to take the dosage as suggested. The beauty of a parasite cleanse with natural antibiotics is that the herbs kill only the harmful microbes and not the beneficial bacteria. Go here for a comprehensive guide to effective parasite cleansing. While doing a gastrointestinal and parasite cleanse, you may add any of these foods for good measure. Not only do they help get rid of H. pylori, they also kill other harmful microbes such as parasites, yeasts and fungi, and contribute to healing of the gastric naturally, without any side effects. A study published in the April 2009 edition of the journal Cancer Prevention Research found that daily consumption of broccoli sprouts inhibits the growth of Helicobacter pylori and reduces the risk of gastritis in individuals infected with the bacteria. The study discovered that sulforaphane is a potent, natural antibiotic that effectively eradicate H. pylori. Baby broccoli, or broccoli sprouts, are preferred due to their much higher concentration of sulforaphane than mature heads of broccoli. The precursor of sulforaphane—glucoraphanin—is present in many raw (uncooked) cruciferous plants. It is hydrolyzed by an enzyme that is present in the human gut. The process begins as soon as the vegetable is chewed or processed (in this case, juiced or blended), making sulforaphane easily available as it travels through the gastrointestinal system. So, how much of broccoli sprouts should you eat daily for this bactericidal therapy? According to the study: 2.5 ounces (70 grams) a day for two months. Put that much broccoli sprouts in a blender and pour some very warm water and soak for about 10 minutes. This will increase the bioavailability of sulforaphane to get the most out of them. Blend it into a smoothie and drink. You may add a little sea salt for taste, if desired. If you are following the above 2-step protocol, it will suffice to eat/drink this broccoli sprout smoothie for 7-14 days from the start of the parasite cleanse. Go here to see how you can buy pre-prepared broccoli sprout juice that contains the highest amount of sulforaphane, to help you fight H. pylori infection. If you cannot get baby broccoli, try this green cabbage juice that has a high content of sulforaphane. Cabbage juice has been reported to be beneficial for curing peptic ulcer and acid reflux. Father of Juicing, Jay Kordich, had made this peptic ulcer-curing juice popular in his time. Now we know that a majority of peptic ulcers are caused by H. pylori, it is likely that cabbage juice has some anti-bacterial activities that are potent. I have personally recommended this juice to my clients who have ulcers and acid reflux. Every one of them who drank the juice for up to 14 days had found the juice to provide tremendous relief and ultimately healed from gastrointestinal issues. Brussels sprouts is another cruciferous vegetable that has been reported to be just as effective in eradicating H. pylori infestation. 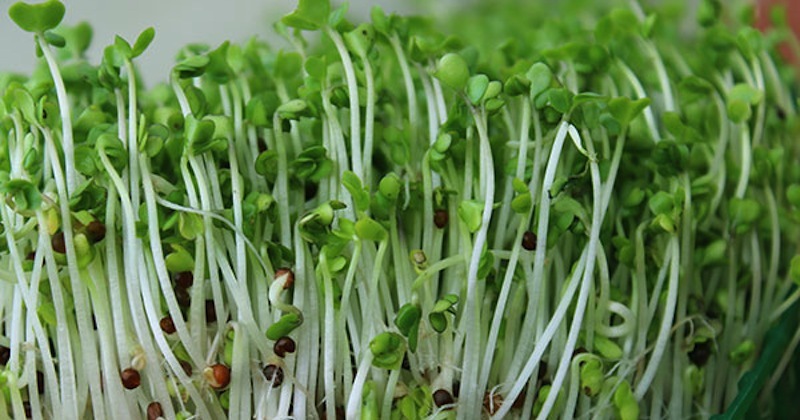 Sprouts always contain nutrients at their peak as they are growing. Just as broccoli sprouts, there is a high chance that this cute vegetable that looks like baby cabbage, is effective for fighting the bacteria. Add it in your diet and juice routine. Garlic is a well-known anti-microbial and has been reported to be effective for at least 13 known infections, including H. pylori. Coconut oil is one of the best sources of lauric and caprylic acid. Studies show that when these acids come into contact with yeast and parasites, they are able to break down the microbes’ cell membranes, preventing the harmful microbes from growing and multiplying. Manuka honey has 13 living lactic acids that are unique properties that have been reported to eradicate more than 250 clinical strains of bacteria, including certain antibiotic-resistant varieties. It has superior antiseptic qualities that are far superior to other types of honey when it comes to killing of bacteria. Cranberry and blueberry juices have long been used for stopping urinary tract infections. Studies show that they are uniquely able to strip bacteria off the bladder wall. It seems promising that these juices are able to prevent the H. pylori bacteria from getting a foothold even in the gut wall lining. Kefir is a probiotic-rich drink that should be included in your diet, if you are fighting a bacterial infection. It contains many strains of probiotics that are superior to yogurt’s. It is also a prebiotic, thus helps to repopulate your gut flora to help strengthen your immune system to fight against an infection. Kefir is suitable to be consumed even by individuals who are lactose-intolerant. Colloidal silver—although it is technically not a food, colloidal silver is one of the best things that kill bacteria and parasites upon contact. It can be taken sublingually for it to work most effectively. Put two droppersful of colloidal silver under the tongue and hold for about 30 seconds, then swallow. Do this two or three times a day alongside the parasite cleanse protocol. There are many more natural foods that are beneficial antibiotics that can be added to your diet, when fighting a bacterial infection. More importantly, avoid foods that feed the harmful bacteria, such as processed foods, sugar, harmful fats, caffeine, alcohol and low-fiber foods. People with stress, anxieties, lack of sleep and staying up late nights are showing lower immunity to fight against bacterial infections. If you are one of them, learn to manage your stress, eat right and try this sleep remedy to improve your immune system.